Authors' Response to "How Income Inequality Feeds the Racial Wealth Gap - CityLab"
• The initial conditions we talk about in our model do not represent the entire or final effects of historical events on African Americans. • We use the word "snapshot" in reference to statistical techniques that characterize data from one point in time, not in reference to the history of abuses against African Americans that generated the racial wealth gap. • Our results call for directing attention back to the role of the labor income gap in perpetuating wealth inequality. We are not saying that policy should focus on reducing the labor income gap to the exclusion of all else. For example, we think that it's important to continue to focus on policies that aim to eliminate racial barriers to wealth accumulation. We provide specific details below. (Comment 2/8) Our analysis does not separate historic factors from income inequality, and in no way do we interpret our results as indicating that historic factors are unimportant for the present-day racial wealth gap. To be clear: We think the current wealth gap is a result of the centuries of violence and robbery that created the wealth gap, as well as the processes these actions set in motion that continue today. But it only explains “snapshot(s) in time,” reads their commentary. (Comment 3/8) Our Commentary does not interpret the narrative above in terms of "snapshot(s) in time." What our Commentary says is that statistical techniques looking at data from one year "tend to represent a snapshot at one point in time." Our work does not run counter to the narrative that black-white wealth disparities in the US are the result of the awful history described above. In fact, our work helps to bring that narrative back into the conversation about the racial wealth gap. Specifically, consider Figure 3 from Barsky et al. (2002). What explains the gap between the expected wealth of blacks and whites for a given income level? The gap in the figure above is the "puzzle" we set out to address in our research. Most of the academic literature has attempted to explain this gap in wealth between blacks and whites in terms of contemporaneous characteristics such as educational attainment. Our approach is different. We ask: Given the history described above, combined with the fact that wealth takes time to build up, shouldn't we expect large differences in wealth between black and white households to remain today? Answering this question is the starting point of our analysis. We set up our model with the differences in wealth actually observed in 1962 (the first year for which reliable wealth data is available), and suppose that income and inheritances follow paths over time like those observed in the data. We find that the historical view is in fact a useful one: Our model makes predictions about the relationships between income, wealth, and race that are similar to what we observe in the data. 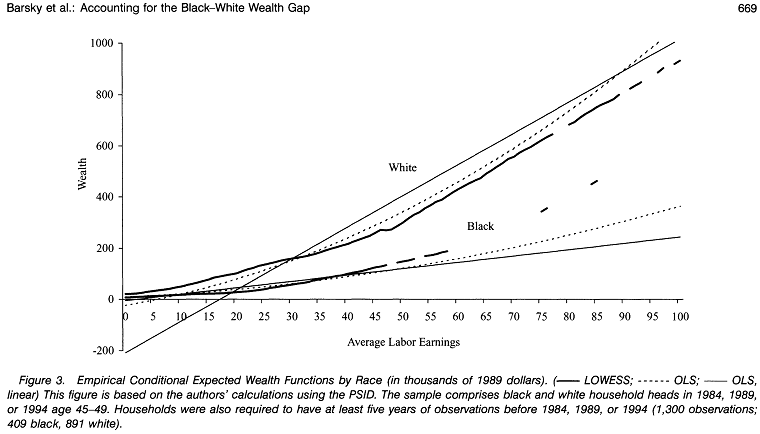 As shown below, our model actually predicts the current racial wealth gap - the "puzzle" just discussed. We want to be clear about the ways that historic factors enter the analysis here. Historic factors are a part of each of the principal mechanisms we study in our analysis. We consider and allow for racial inequality in initial conditions, returns on capital, inheritances, and labor income. To start, there is the history of centuries of violence and robbery that led to the racial wealth gap in 1962, just prior to the passage of civil rights legislation (as noted above, 1962 is the year in which we start our analysis because it is the first year in which we have reliable wealth data). The wealth gap at this point in time, by itself, is what we refer to in our analysis as initial conditions. Unequal returns on capital represent an important mechanism to include because of the history of redlining and the continued segregation of US cities, along with the role of homeownership in building wealth in the US. Our model also allows for unequal inheritances, or the intergenerational transfer of wealth. This is an important mechanism to include because the initial wealth gap from 1962 was so large that one might imagine it being self-sustaining even if all other factors were equalized. Finally, there is labor income. Our model includes a racial income gap, but we make no claims about what generates that gap. The racial income gap could be generated by any combination of: continued discrimination in the labor market, neighborhood sorting and externalities as we studied in an earlier paper and as originally discussed in Wilson (1987), a skill gap maintained by the related issue of continued school segregation, changes in the return to cognitive or non-cognitive/social skills over time, incarceration policies, the role of wealth in facilitating a college education (related theoretical and empirical studies), household formation, housing instability, differences in mortality rates (which appear even at young ages as documented here and here), correlated income shocks through the obligation to support one's family, etc. When we write that the labor income gap is the largest factor maintaining the racial wealth gap, we are in no way claiming that the processes generating the labor income gap are not affected by historic factors. Perhaps this claim could be inferred if one were to (incorrectly) interpret initial conditions as representing all historic factors in our analysis. This claim might also be inferred because we have intentionally stayed agnostic about what generates the income gap. The reason we have not more directly addressed the labor income gap is because even if we incorporated one or two of the factors listed in the paragraph above into our model (which would already be very difficult with this kind of model), it would feel like we were limiting the discussion by ignoring a group of other very important factors. For their current study, they examined the “dynamic nature of wealth accumulation” over time. Using these dynamics, they argue that starting in the 1960s, the initial conditions that birthed the black-white gap—slavery, redlining, etc.—began diminishing as the drivers of the wealth disparity. (Comment 4/8) Thinking of our analysis as treating "initial conditions" and "historic factors" as being interchangeable is likely to be a source of misunderstanding. (Comment 5/8) Again, thinking of our analysis as treating "initial conditions" and "historic factors" as being interchangeable is likely to be a source of misunderstanding. Also worth reiterating from Comment 3 is that the "puzzle" we set out to address in this research is not generated by focusing solely on initial conditions, but rather by not sufficiently taking initial conditions into account. (Comment 6/8) Note: Here "the same" means identical in terms of preferences over consumption, leisure, and time, so that our analysis does not consider these types of differences as potential explanations for the racial wealth gap. (Comment 7/8) Initially, we were surprised by our main result: We also expected that homeownership and the intergenerational transfer of wealth would be at least as large of factors in maintaining the wealth gap as income differences. The role of homeownership is captured in our model by unequal returns on capital. This mechanism is suspected as a contributor to the wealth gap because of the history of redlining and the continued segregation of US cities. The intergenerational transfer of wealth is captured in our model by unequal inheritances. This mechanism is suspected because the initial wealth gap from 1962 was so large that one might imagine it being self-sustaining even if returns to capital and labor income were the same. Racial disparities in mortality rates also seemed like they might play an important role in what our model predicted, because these differences are in fact quite large. After reflection, though, we think it does make sense that unequal labor income matters more than unequal returns on capital and inheritances, even given the tremendously different initial conditions faced by black and white households. Three reasons are as follows: First, our results point to a view of ownership of assets like homes and retirement accounts as a way of storing wealth generated by income rather than as a way of making huge returns. While there certainly are exceptions, this is probably the most accurate general characterization. Second, the best empirical evidence we have suggests that large intergenerational transfers are simply too rare to be the main driver of the wealth distribution. Finally, when added up over time, it is not surprising that differences in income drive differences in wealth. Daniel likes to think of this in terms of an analogy using the speed and position of two cars: A relatively small difference in speed can lead to a large difference in absolute position if it persists over time. The key policy implication of our work is that policies designed to speed the closing of the racial wealth gap would do well to focus on closing the racial income gap. Of course, this focus leads to another broad set of questions surrounding the racial income gap. For example, what is the relative importance of factors such as racial discrimination in the labor market (Bertrand and Mullainathan, 2004), incarceration policies (Neal and Rick, 2014), and skills (Neal and Johnson, 1996) in maintaining the racial income gap? Even more broadly, social scientists since Wilson (1997) have focused on the role of factors such as deindustrialization, neighborhoods, and schools in the persistence of the racial income gap. Recent findings that the intergenerational transmission of income is lower for blacks than for their white counterparts at all levels of income (Chetty et al., 2018), and that the same is true for neighborhood quality regardless of wealth (Aliprantis et al., 2018b), suggest that policies successfully addressing the racial labor income and wealth gaps will have to address a broad set of issues. Through the organization Architecture for Children, Hong Kong architect Vicky Chan has taught urban design and planning to thousands of kids. Here’s why.